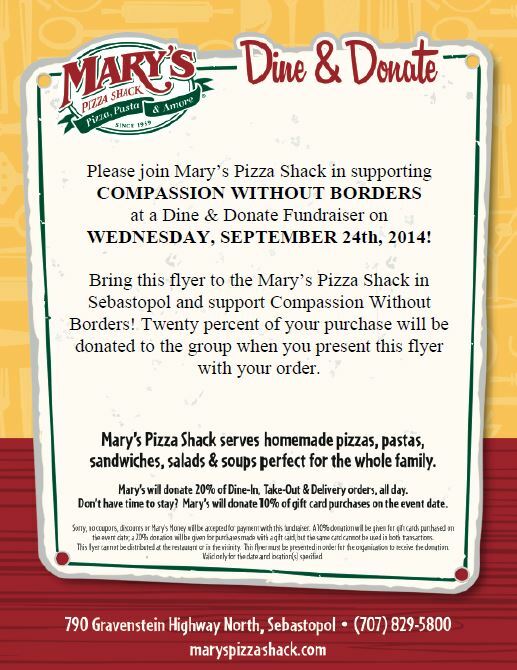 On Wednesday, September 24th, from open to close, Mary’s Piz za Shack in Sebastopol is generously supporting Compassion Without Borders by donating 20% of the proceeds of the business we bring to them! (They will donate 10% for take-out & delivery). Donations from events such as these are so helpful as CWOB does not receive any federal, state, or county funds, so we depend on partners like you to help us give thousands of animals the care and services they need to find safe, loving homes. Every dollar counts! Please remember to print out the flyer (the one on the cover photo of the Facebook event – or email us and we’ll send you one directly) & show it to your server when you first arrive. We are so excited about this event & hope to see you there!! Thank you so much for supporting Compassion Without Borders! Posted in Animals, Chihuahua Rescue, Dog Rescue, Local ClinicsTagged Adopt, animal over-population, Animal Welfare, Animals, Dogs, Foster, Foster Dogs, Mexico, Spay/Neuter, Wellness ClinicsBookmark the permalink. Hi Barbara – Thank you so much for checking. I’ve re-connected the link to the correct Facebook event for the 24th so it should be squared away now! Thank you so much again! Very much appreciated! Crossing the Finish Line; $900+ Raised for CWOB!